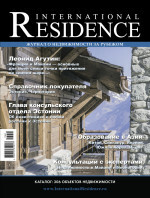 International Residence is Russia's leading overseas property magazine in Russia and the CIS. This specialized publication educates and advises on the variety of high level properties that are available around the world. Our aim is to be International and objective in the articles that we publish, on the purchase and investment of property around the world. The Editorial Team works hard to ensure smooth transition from International standards to suit the mentality and expectations of our Russian speaking readers. International Residence is the "Official Magazine" for the most successful Overseas Real Estate exhibitions in Russia (including the Moscow & St. Petersburg International Property Shows) enabling us to ensure that each visitor to these 8 specialised events a year receives a copy. Your advertisements are placed directly in the hands of this targeted audience.